You could have these ready in the same amount of time it takes the kids to unload their backpacks, change into play clothes and geth their homework lined up on the table. I’ll show you how it’s done! Minute 1: Get out a can of black beans, open it, drain it and dump it in a bowl. Reach into the fridge for the salsa, shredded cheese and tortillas from the fridge. 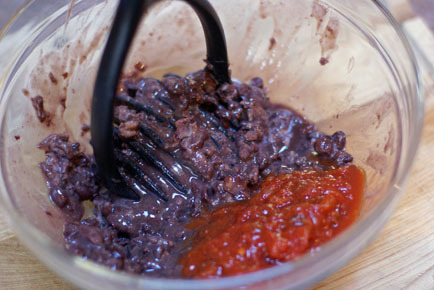 Minute 2: Mash the black beans, add the salsa. Mix together and spread evenly onto 4 large tortillas. Minute 3: Roll up each of the tortillas and arrange them seam-side down on a microwavable plate. Minute 4: Microwave them for a minute…maybe 2. However long it takes to melt the cheese. Serve them to the hungry little people before they have a chance to whine and complain about how hungry and tired they are from being at school all day. Beat the crank before it starts! Best part isn’t the 4 ingredients. Or the 4 minutes. It’s that the kids get a fiber-filled, protein rich, whole grain after-school snack that is sugar-free! Mash the black beans in a mixing bowl, then add the salsa. Combine until smooth-ish. 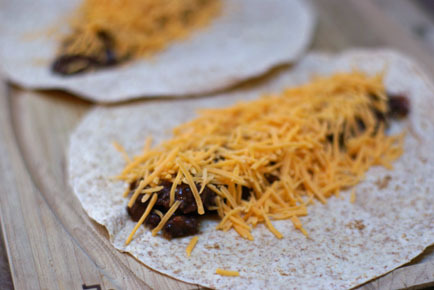 Spread evenly onto the tortillas and top with shredded cheese. Microwave for 1-2 minutes, or until cheese has melted to your liking. looks yummy! May make them for me! Where do I get whole wheat tortillas so cheap. That is 10 cents each and I have see them in packages of 10 for more like $4 a package. That is one place I have not been able to go white flour free. I have a family of 6 with a hungry 17 year old boy. I am constantly balancing quality (better food but less) vs. quanity. The amount of tortillas we go through, I just can’t keep up with the whole wheat kind. Any suggestions? they sound really good to me though! I don’t know if you live near a 99 cent only stores— a chain here in the West— I get my W/W tortillas there– made by the same company that makes them for the grocery chains, but different packaging and a little smaller. I live in California and can get the flour torilla shells at the 99 cent store for 99 cents, but also if you check your local stores and get off brands you can usually get flour or corn torillas alot cheaper than $4.00. I usually pay under $2.00 for more torillas than I can eat. I keep them in the fridge till I use them to keep them from spoiling. 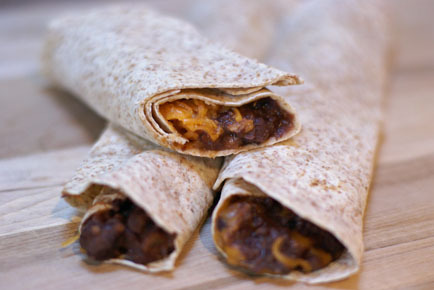 I have used refried beans and cheese with torilla shells the same way as above. I also put shredded or regular cheese sandwiched between to flour torillas and microwave it till the cheese melts for a quesadia. Also great treat. But I want to try this one. Haha, I dont have kids, but I get such a kick out of reading these posts. The *snicker* *snicker* part totally had me giggling. I love passing these on to my sister who has a 7 year old boy who eats surprisingly well. Thanks for the awesome reading & recipes, Erin, you rock! Tortillas are expensive but can be made from scratch. I have heard they are easy to make but I have never tried….maybe I should though. These really look good. I absolutely love black beans. Now if I can just get the kids on board with this! Pet Peeve time. 🙂 These are called Burritos! Tacos are made with corn tortillas. Love black beans, they are the best. For cheap tortillas (and bread for that matter) look into outlet bread stores. I have both Hostess and Oroweat outlet stores relatively close to home and I don’t live in a huge city. I can pick up 30 count packages of tortillas for less than $1 in all kinds. Just an idea!